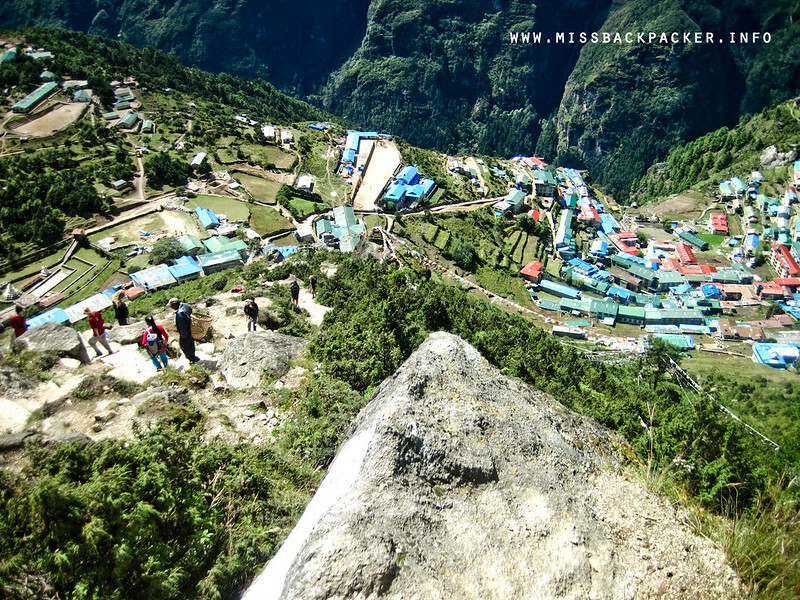 EBC Day 3: Acclimatization in Namche Bazaar | Where Have You Been Lately? Waking up to clothes you wore the day before which absorbed all your sweat and whatnots, who wouldn’t enthusiastically jump out of their beds to change and freshen up themselves? Rise and shine, Budiday! It’s Day 3 and you have a wonderful day ahead of you! The view from our lodge. Amazing! Alright, headache had gone again. Another great sign that I wasn’t hit by acute mountain sickness (AMS), only a plain case of headache. But changing clothes? That was the least of my priorities during D3. You see, when you’re in the mountains, nobody really cares about your clothes, your smell, or the way you look. It’s not that being hygienic is unimportant, but you have other and far more important things to worry about like how not to get sick. 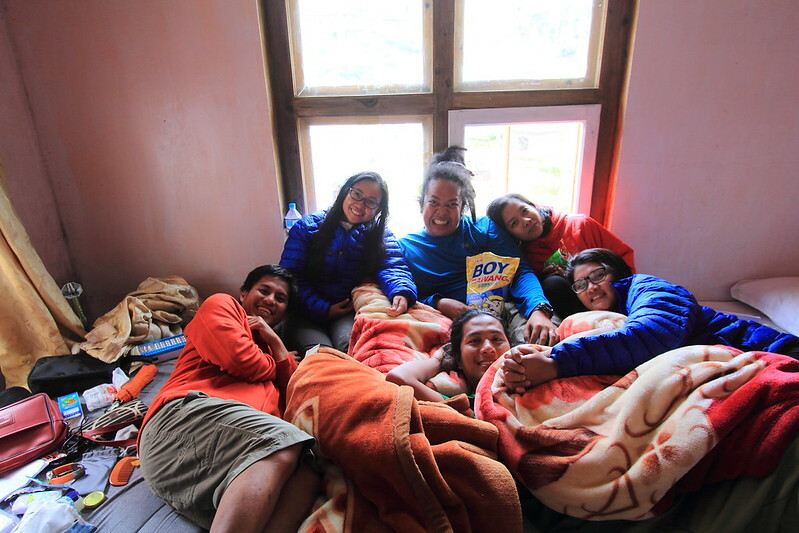 So what I did first thing in the morning was brush my teeth, put on deodorant, and headed straight to the common room-slash-dining area where all the trekkers were already having their breakfast. 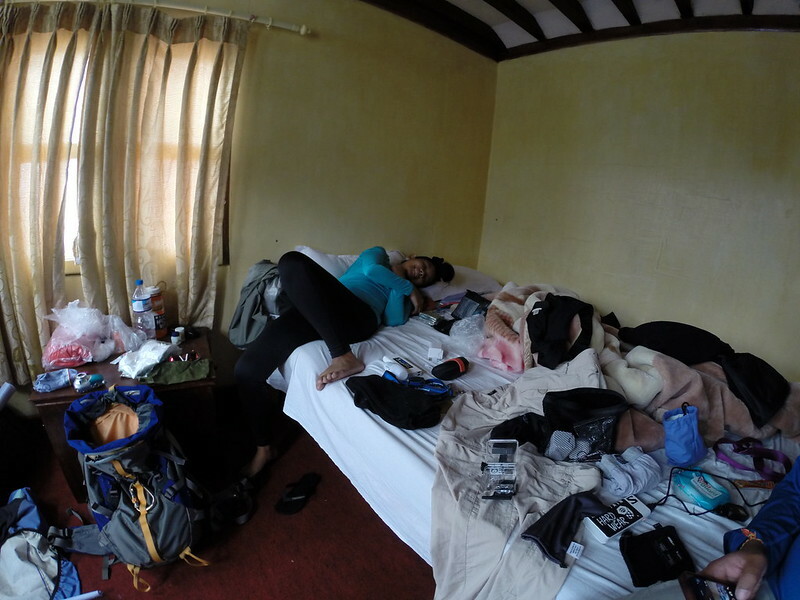 This is how our room looked like pre and post-trekking. I can no longer recall what I had that morning, it wasn’t just worth remembering. What I do remember is how phenomenal the views were from where we were lodging. There were just snow mountains everywhere and we could see them because of the great weather! See those white flags in the upper center portion of this photo? That’s Syangboche Hill and where we were headed on D3. After breakfast, Bikal announced that we’re hiking to Syangboche Hill (3780 M) for acclimatization but we would first stop by Conservation Memorial, a portion of the Sagarmatha National Park. The activity would last for three or four hours and so at 8:30 AM, we started walking, er, hiking. The teahouse we were staying was at the bottom of the village and so we had to hike quite longer compared to other trekkers. A view of the village on our way to the Conservation Memorial. 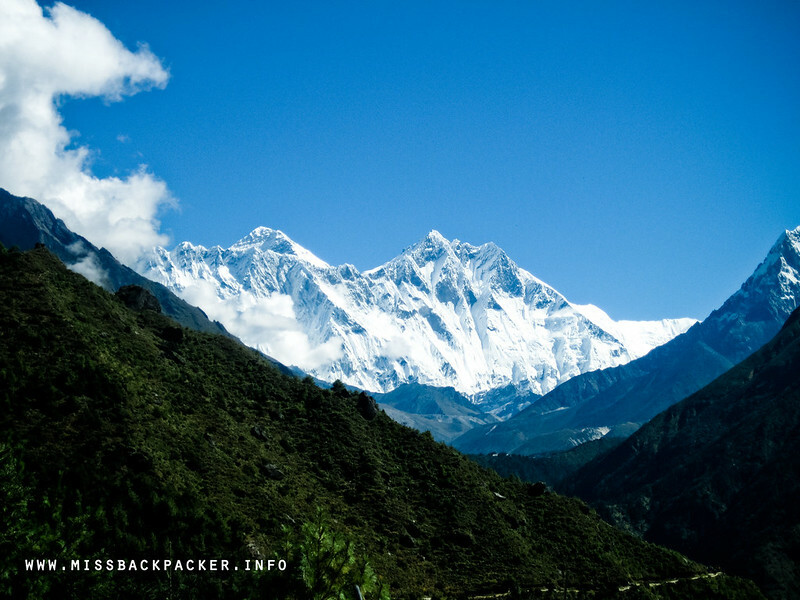 Upon reaching the memorial premises, we were greeted by Mounts Nuptse, Lhotse, and the mighty Everest in their full glory as shown in the view deck of the park headquarters. We missed catching sight of them the other day and we were so ecstatic to see them during D3. We were lucky that they had shown their beauty, a luck that is not shared by many. I pity those who only visit Namche Bazaar when it is cloudy or foggy as this is the only spot where they can have a good view of these mountains. 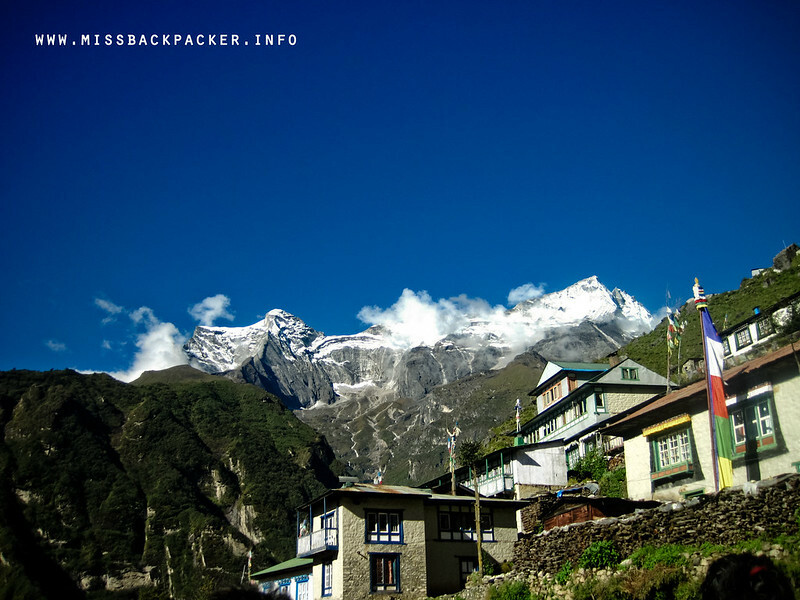 Nuptse on the left, Lhotse on the right. And yep, that’s Everest at the back. 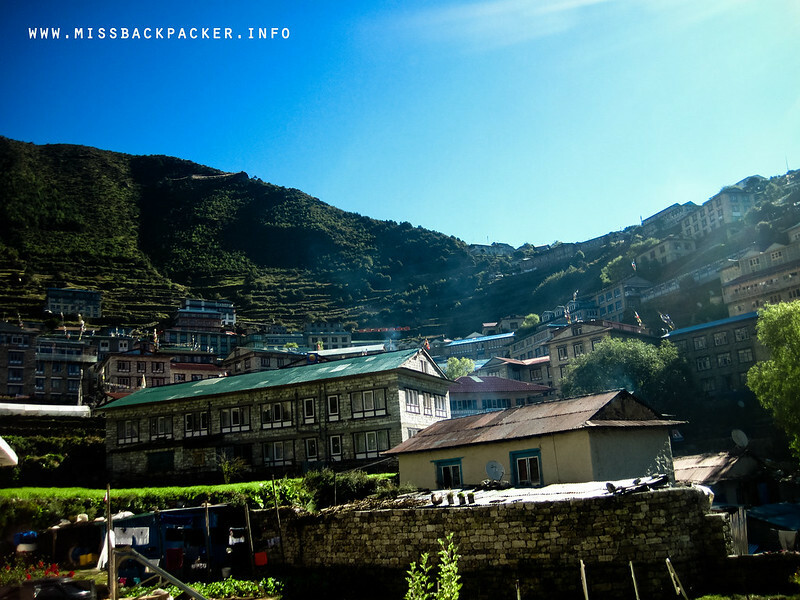 After taking photos of ourselves, the views, and the place, we went inside the museum where a handful of information about trekking in the Everest Region are showcased—history, culture, and other significant things. 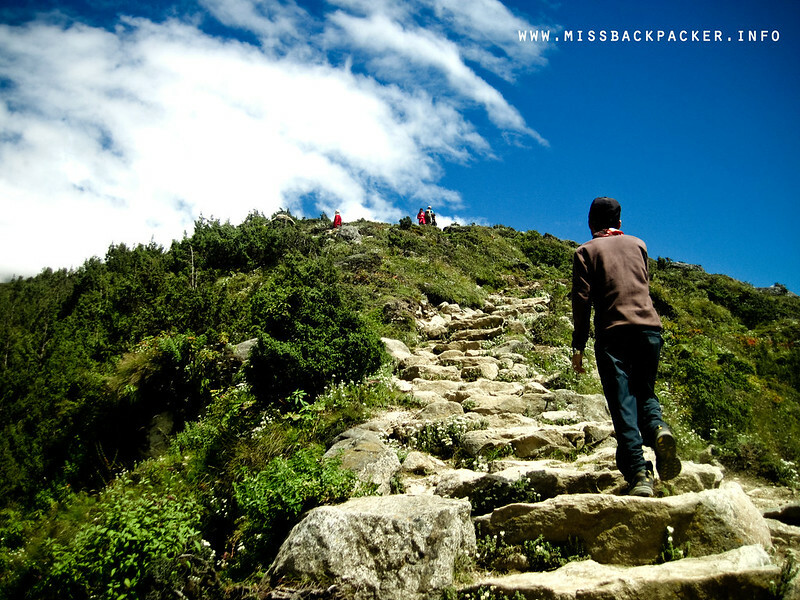 There was another museum just below the Conservation Memorial called Sherpa Museum but we skipped it and started hiking to Syangboche Hill. 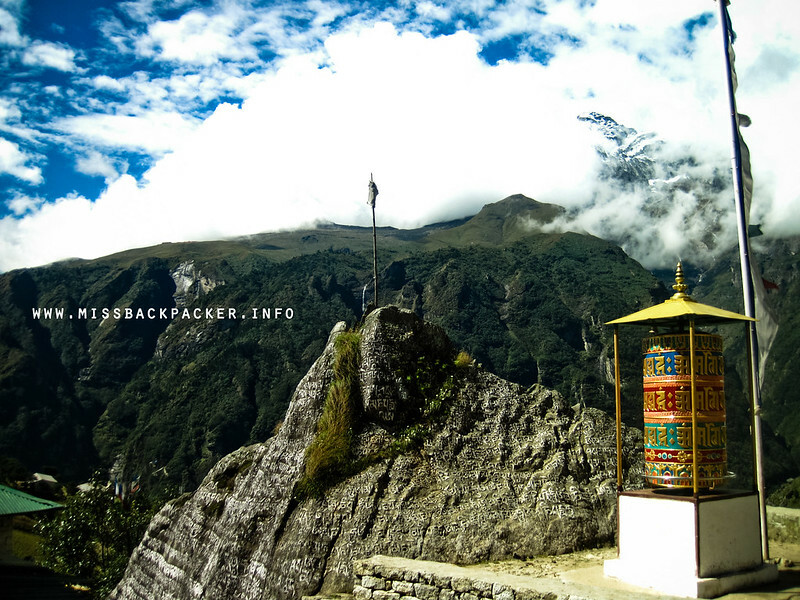 This Mani stone and prayer wheel signifies the start of your steep ascent to Syangboche Hill. The scorching sun against the freezing air. To put on a jacket or not? 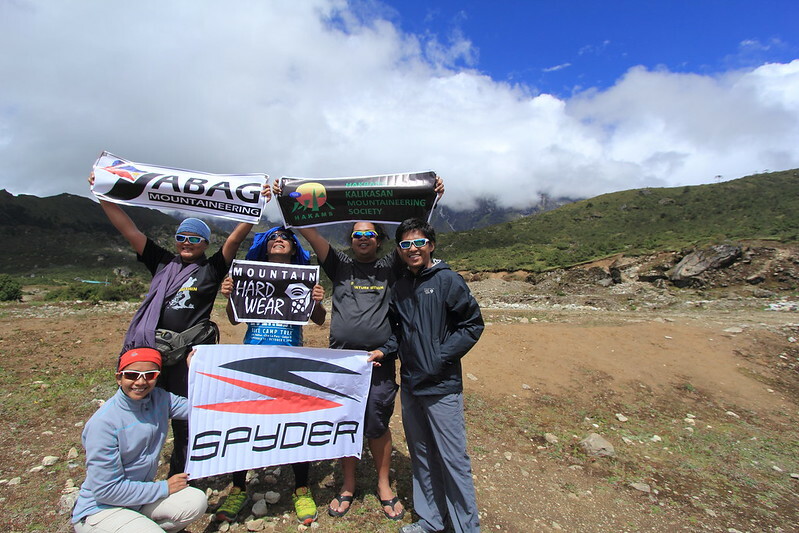 At 11:00 AM, after almost two hours of hiking from the Conservation Memorial, Agot, Migs, and I reached 3780 M. While waiting for the rest of the team, the three of us had decided to no longer continue hiking to a higher elevation (there’s an option to hike further for better acclimatization). 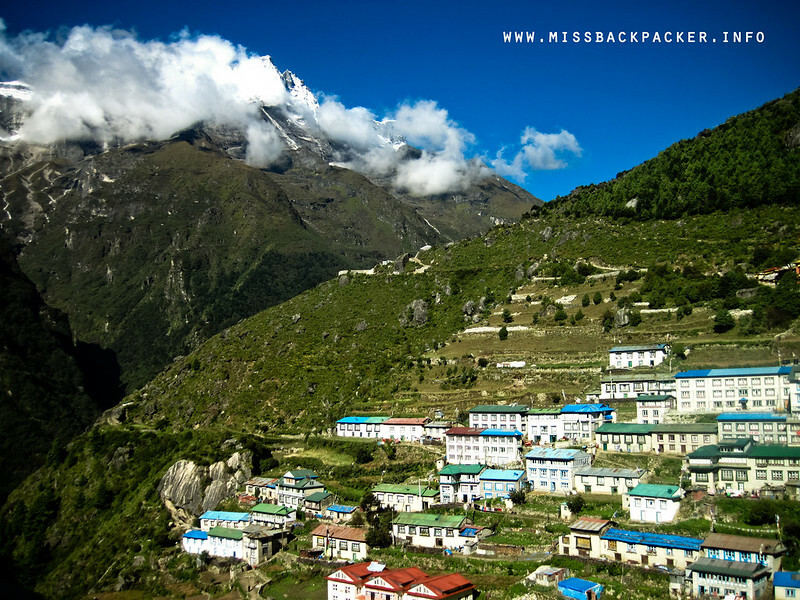 From where we were, we had a closer view of the Syangboche Airport and the Kunde Hospital, two of the most vital places in this part of the Khumbu Region. A few more minutes passed, Dwine and Rowjie arrived. We were waiting for Doc Rhoda but Bikal said she opted to not hike any further. We took some photos and then immediately started our descent. Now the heat of the sun was more prominent and the drop was knee-breaking. With rumbling tummies, it took us around half an hour to get back to the village. Who would disagree that all things are possible with a hungry stomach? 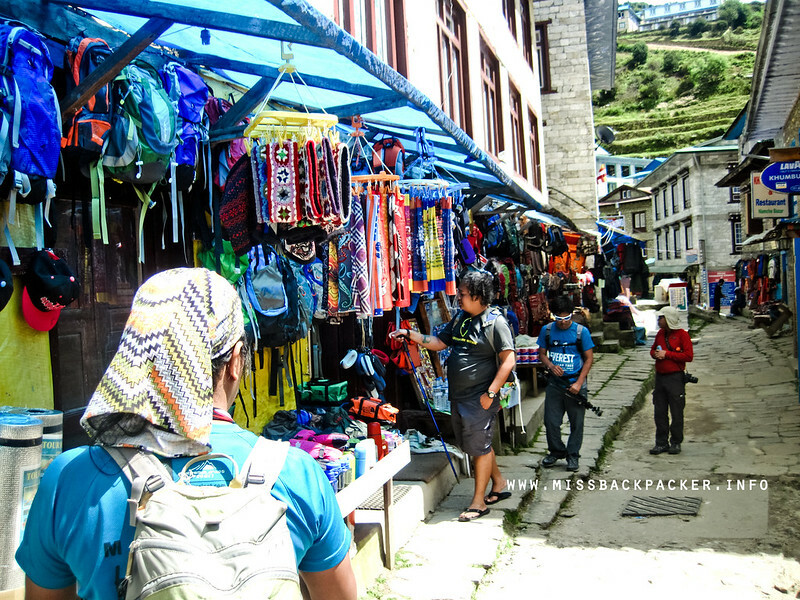 Despite nearly being famished, we couldn’t afford to miss dropping by the famous outdoor stores of Namche Bazaar. The world at my feet, literally. We’ve read blogs saying that the goods being sold in the outdoor shops of the Sherpa capital are way cheaper compared in Kathmandu. We were all excited for a shopping spree! But when we started window shopping, we realized that there wasn’t much of a difference with the pricing. If not at par, the prices are even more costly. The higher the elevation, the more expensive the products and services are. Why have we not thought about it? Dwine, Rowjie, and I went back to the teahouse without buying anything. The rest of the team had to purchase some outdoor gears because they NEED it and not because they want it. Genuine or knockoff, Namche Bazaar has it. 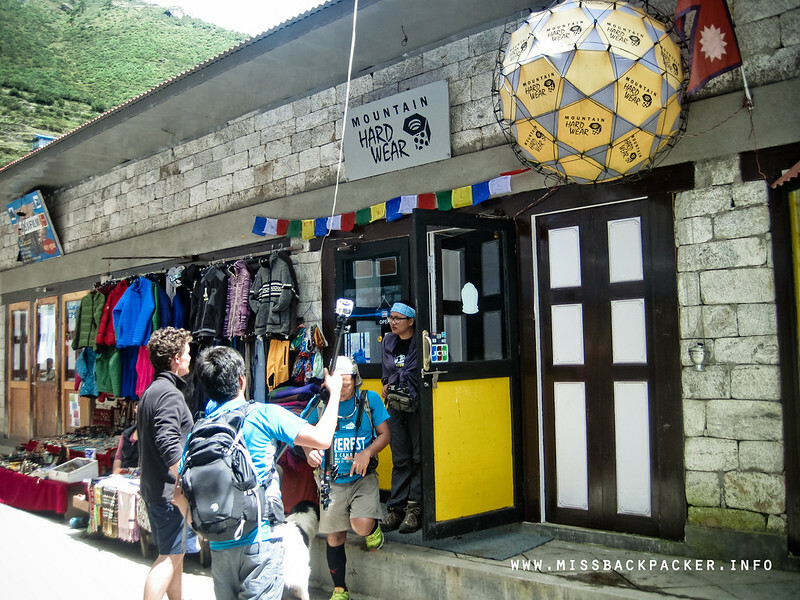 Here’s the Mountain Hardwear shop we all dreamt of visiting. We arrived at the teahouse around 1:30 PM. That’s a total of five hours of hiking, descending, and window shopping. We ordered our late lunch and had our most awaited free and hot bath after. The rest of the day was spent with us just sharing stories and laughter. It was drizzling during the night and so we went early to bed. Funny though that it wasn’t that cold. My body might have been longing for that bone-chilling feeling that I couldn’t sleep. For a moment, I took pleasure from watching the movement of lights from around the village that were visible from our room. Then the mountain gods and goddesses might have heard my heed. I now fell to a deep slumber. Good night, D3. Waaaaahhh! More! More! Grabe, ganda na ng scenere sa Namche pa lang! Angel, day 3 pa lang yan tapos point and shoot lang gamit ko. Mapapanganga ka sa Days 7 at 8. Ay naku, nae-excite ako para sa EBC mo.